The Samsung Galaxy S9 has just been attacked – and that’s a very good thing. Through knife and fire abuse the S9 has shown just how tough it really is. 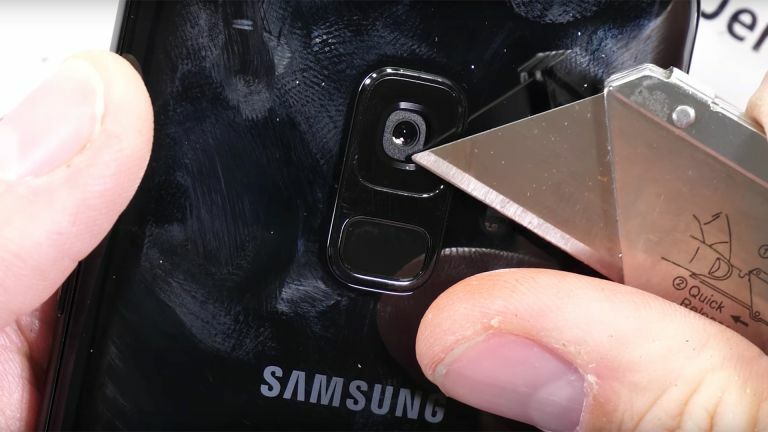 We already knew that Samsung did a few things to make the Galaxy S9 more durable, but now, in a video, uploaded to YouTube by JerryRigEverything, the new Galaxy S9 was put through its paces in a durability test which involved a razor blade and a lighter. The result? The Samsung Galaxy S9 is tougher than the S8. While there was still scratching to the outer shell of the phone when knifed with a razor blade – obviously! – the camera casing was super tough. This showed no signs of scratching at all. The fingerprint sensor, now under the camera, took some serious abuse from the blade. However, despite the aesthetic damage, the sensor continued to work just fine. That's impressive. On to the fire test. This involved holding a lighter up the to glass-encased Super AMOLED display. The result was a whitening of the pixels but once the heat was removed they returned to a normal working state. The oleophobic layer on the glass, which usually keeps smudges and water at bay, did melt leaving a bit of a mark on the screen. A notable improvement over older models is the seal of the glass and metal. When put under bend pressure the phone remained solid where in the past with the S7 there was separation which did affect waterproofing. The Samsung Galaxy S9 is available to pre-order now for a March 16th general release.